TORONTO, ON – Bellwoods Brewery has announced that it is bringing together 15 breweries from across North America, the UK, and Europe to take part in a festival later this month. 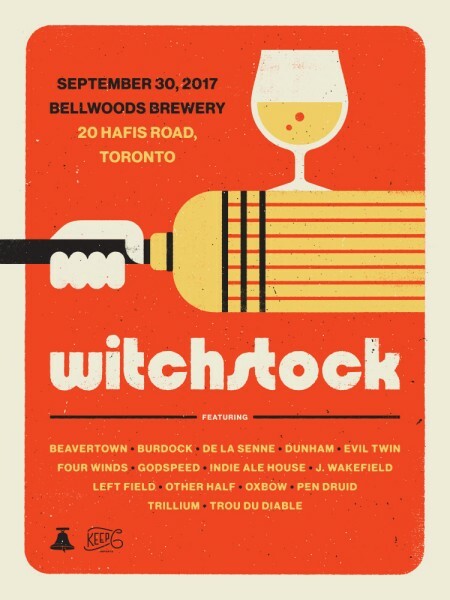 Witchstock 2017 will take place on Saturday September 30th at Bellwoods’ 20 Hafis Road location, and will feature beer from Beavertown, Burdock, De La Senne, Dunham, Evil Twin, Four Winds, Godspeed, Indie Ale House, J. Wakefield, Left Field, Other Half, Oxbow, Pen Druid, Trillium, and Trou Du Diable, as well as Bellwoods. A variety of limited edition merchandise including posters and t-shirts will also be available, and Bellwoods will be releasing several one-off beers in the bottle shop that will be available exclusively to festival attendees. Local food vendors will also be on hand. The event will include two sessions – 12:00 noon to 3:00 PM, and 4:00 PM to 7:00 PM – with a strict limit of 350 tickets per session. Tickets for Witchstock will go on sale on Tuesday September 5th at 10:00 AM via the Bellwoods website at a cost of $45 (plus fees and tax), which includes 4 tokens for 5 oz samples, a souvenir glass, and a sticker. Additional drink tokens will be available for $3 each. For more details, see the full announcement on the Bellwoods website.